Well, I made it just under the deadline! Whew! This month’s Island Batik challenge was quite the pistol, frustrating my efforts to meet the challenge at every turn. You can read about some of the challenges I faced here (such as cutting some of the squares for the flying geese the wrong—although as you can see they ended up coming out okay). Other challenges included not realizing that I barely had enough yardage of a coordinating batik to add a border (smaller than I wanted and not the two I had originally envisioned) and not coming even close to having enough yardage for the backing. For the backing I had to use something that wasn’t an Island Batik. You see, our challenges should be made entirely with the Island Batiks we are sent. Normally that works out just fine, except when my brain goes on a vacation when calculating the feasibility of a design for this month’s challenge and I forget to add backing, borders, and binding into the equation and simply assume I have enough on hand. <grin> Luckily for the binding, I just had enough of the layer cake I was using to create a scrappy one. Oh well! I feel like I created these stumbling blocks with the size of the quilt I designed so it was up to me to overcome them one by one. I’m very happy to report that I’m over the moon with the results. By the way, the challenge this month was to create a quilt using stars—pieced, appliqued, paper-pieced, whatever. How we interpret each month’s challenge is up to us. I’m calling this Stargazer Too, because it’s a variation of my pattern Stargazer which appeared in my book. Stargazer Too is made from a layer cake from the Paisley Dot collection and background yardage, in this case a White batik. Did you know that Island Batik offers a white batik that looks similar to a white solid but is a batik? It’s pretty awesome! Because I was working with a layer cake, I knew my quilt would be scrappy. The only thing I could control was the placement of light and dark, so I mocked up two monochromatic samples. I ended up choosing the one shown here on the right, with the light squares placed on the diagonals of each block, and the dark fabrics in the star points. I felt that with this placement, you would really see the stars in the blocks and the stars created by the secondary design. For the quilting, I emphasized the diagonals by quilting three wavy lines in each direction. For the stars created by the secondary design, I quilted a square on point, again using wavy lines. I extended the quilting lines into the border because I felt that matched the quilt’s modern look. 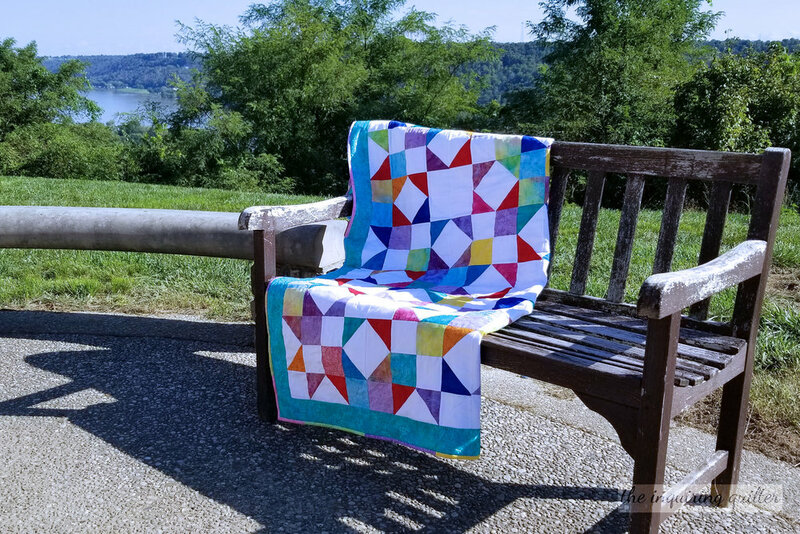 As I mentioned before, I used up every bit of that layer cake to make the quilt, including using the scraps left over after cutting the pieces for the blocks to make a scrappy binding. I was at a quilt retreat this weekend and finishing this quilt was my top priority. I’ll show you the rest of the things I got done at the retreat later, but for now I just wanted to add how awesome it was to show off my batiks at the retreat. Not to mention the built-in gorgeous backdrops I had for taking photos of Stargazer Too once I got her done. Here’s a quick photo of the back. It’s a print by Amy Butler that I bought years ago. It coordinated with the front and I had enough of it (4 yards) so it was a winner in my eyes. Fabrics: Island Batik Paisley Dot collection and White batik (from the Basics collection) for the blocks, plus BE36-D1 Small Pointed Floral Turquoise from the Blenders collection (for the border) and Southern Blooms Grass Lavender (for the binding, with the rest of the Paisley Dot collection). Backing is PWAB150 Oh Deer from the Bright Heart collection by Amy Butler for Free Spirit. My plan is to make a pattern for this one, so look for it soon. Tell me..do you have a favorite star quilt?